Ciprofloxacin (Brand Name: Ciproxin)belongs to a group of broad-spectrum antimicrobial drugs known as fluoroquinolones. 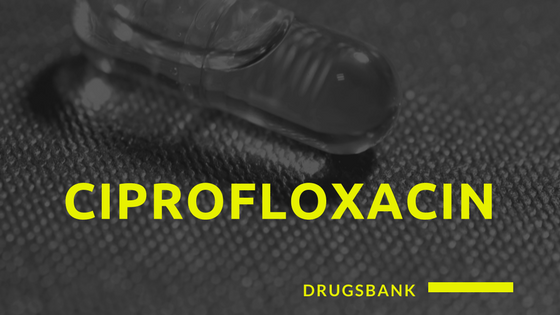 It is the most active second generation fluoroquinolone against a wide range of bacteria that are susceptible to Gram-negative aerobic rods, especially the Enterobacteriaceae Neisseria. Ciprofloxacin is effective against Staphylococcus aureus and Staphylococcus epidermidis.It is active against susceptible strains of Staphylococcus aureus and is not effective against Methicillin-Resistant Staphylococcus aureus. Ciprofloxacin (Ciproxin) has a very good activity against gram-negative bacteria, but enterococci, Streptococcus group A, B, D and streptococcal viridans with moderate susceptibility to ciprofloxacin. It is also very effective against Mycobacterium tuberculosis and M.Kansasii M.Fortuitum.If used alone is not effective against M. avium infections caused by M. avium infection. They must be combined with other tuberculosis drugs rifampicin and ethambutol. Novidat Manufactured By Sami Pharmaceutical Pvt Limited. Novidat is available in Dry Powder For Suspension. 125mg/5ml. Novidat Injection 200 mg 1 Vialx100 mg.
Mercip 500mg tablet manufactured By Merck. Urinary tract infections (UTIs) caused by certain bacteria such as E. coli. Pulmonary or respiratory tract infections, for example, tuberculosis, lower respiratory tract infections, and chronic bronchitis) Pneumonia and sepsis caused by Yersinia pestis (Y. pestis). Infectious diarrhea caused by E. coli, Campylobacter jejuni, and Shigella. Prophylaxis of infections in neutropenic / cancer patients and other sensitive patients. Patients with anthrax with fever and low white blood cell count as well as intra-abdominal infections. It is rapidly absorbed orally, but the diet delays the intake and first-pass metabolism occur. The key feature of ciprofloxacin is high tissue penetration. The concentration in the lungs, sputum, muscles, bones, prostate, and phagocytes exceeds that of the plasma. It is excreted mainly in the urine, both glomerular filtration and tubular secretion. Urinary and biliary concentrations are 10 to 50 times higher than those of plasma. Ciprofloxacin ( Ciproxin ) inhibits the synthesis of DNA in microorganisms by inhibiting the bacterial topoisomerase enzyme DNA (DNA gyrase). This prevents relaxation of the supercoiled DNA and thus prevents normal transcription and replication in the body. When we give the patient Ciprofloxacin (Ciproxin). Ciprofloxacin enter into Bacteria by passive diffusion and approached Topoisomerases enzyme and they bind to DNA gyrase domain of the enzyme and block or inhibit it so the other domain (nuclease) keep on cutting the overtwisted DNA but the Ligase point Can’t reseal it because of Ciprofloxacin (Ciproxin) and in the end all the bacteria divided into fragments and bacterial death occur. Ciprofloxacin ( Ciproxin ) has a good safety profile and side effects are present in only 10% of cases, but they are generally mild. Here are some of the side effects associated with the use of Ciproxin. Nausea, vomiting, and diarrhea may occur. Ciprofloxacin may affect the clearance of theophylline and cause an increase in serum concentration. Headaches, insomnia, dizziness, liver problems and rashes can sometimes occur. Ciprofloxacin can cause tendonitis, which is a serious complication in adults and can cause tendon rupture. Although tendonitis occurs rarely (some cases have been reported), but is more common in elderly failure, renal failure, and renal failure in people with corticosteroids. Skin / Hypersensitivity are rashes, itching, photosensitivity, swelling of the lips, urination, and swelling of the lips. Serious skin reactions are rare. The use of ciprofloxacin for long periods can lead to oral candidiasis or a new yeast infection such as white spots in the mouth, a change in vaginal discharge. Ciproxin is contraindicated in pregnancy because ciprofloxacin has caused arthropathy in animal studies. However, to prevent a secondary case of meningococcal meningitis, a single dose of ciprofloxacin may be used. 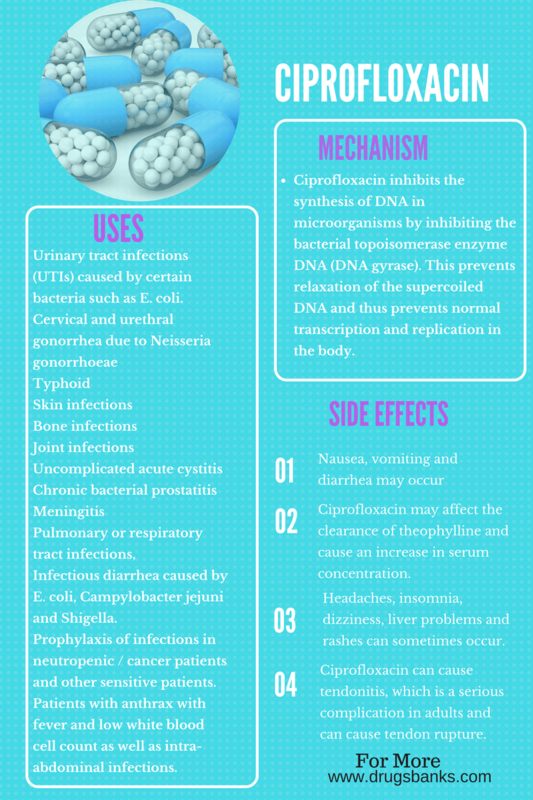 Some medicines may affect the action of ciprofloxacin, and ciprofloxacin may affect other medicines you ingest. Many antacids, vitamins, and supplements containing magnesium, calcium, aluminum, iron or zinc can interfere with ciprofloxacin. Other over-the-counter medicines, which include painkillers and fever medicines such as ibuprofen, naproxen, may also interact with ciprofloxacin. Ciprofloxacin can increase the effects of caffeine. If you are taking caffeine-containing drinks or over-the-counter medications that contain caffeine while you are taking ciprofloxacin, you may have some side effects of caffeine, such as nervousness, insomnia, or anxiety. You may not be able to take Ciprofloxacin if you also take the drug Theophylline for the treatment of asthma and wheezing. Severe reactions such as heart attack decreased the ability to breathe and seizures have occurred when people have taken these drugs together. Certain antidepressants and drugs for the treatment of mental illnesses, such as clozapine. Certain medications for an irregular heartbeat, such as amiodarone , disopyramide, and procainamide. The drug for arthritis methotrexate. A drug used to treat nausea, vomiting, heartburn, and reflux called metoclopramide. Type 2 diabetes drug Glyburid. Some nonsteroidal anti-inflammatory drugs (NSAIDs), such as ibuprofen and naproxen. The usual recommended dose for urinary tract infections in adults is 200 to 400 mg IV every 8 to 12 hours for 7 to 14 days, while the oral dose once 250 to 500 mg orally every 12 hours for 7 to 14 days. The usual adult dose for a soft tissue infection or skin is 400 mg IV every 8 to 12 hours, and orally 500 to 750 mg orally every 12 hours for 7 to 14 days. The usual adult dose for infectious diarrhea is 500 mg orally every 12 hours for 5-7 days. The usual adult dose for pneumonia is 400 mg iv every 8 to 12 hours and the oral dose of 500 to 750 mg orally every 12 hours for 7 to 14 days. The usual adult dose for joint infection is 400 mg iv every 8 to 12 hours and an oral dose of 500 to 750 mg orally every 12 hours for 4 to 8 weeks. The usual adult dose for sinusitis is 400 mg IV every 12 hours and an oral dose of 500 mg orally every 12 hours for 10 days. The usual adult dose for typhoid fever is 500 mg orally every 12 hours for 10 days. The common adult dose for gonococcal infection – uncomplicated is 250 mg orally once. The usual adult dose for Chancroid is 500 mg orally, twice daily for 3 days. The usual preoperative dose for surgical prophylaxis is 400 mg intravenously, starting within 120 minutes of the surgical incision. I took. One dose of Cyprofloxacin 500 mg followed about seven hours later by Amox K Clav and I woke at 4 am with a nervous reaction which lasted a good six hours. I took another dose of Cypro this morning when I was no longer nervous. I am somewhat hesitant to take another dose as I have an EMG scheduled for tomorrow morning for possible nerve or muscle damage to my left leg. Any comments? What to Do When Sore Throat Doesn’t Heal?